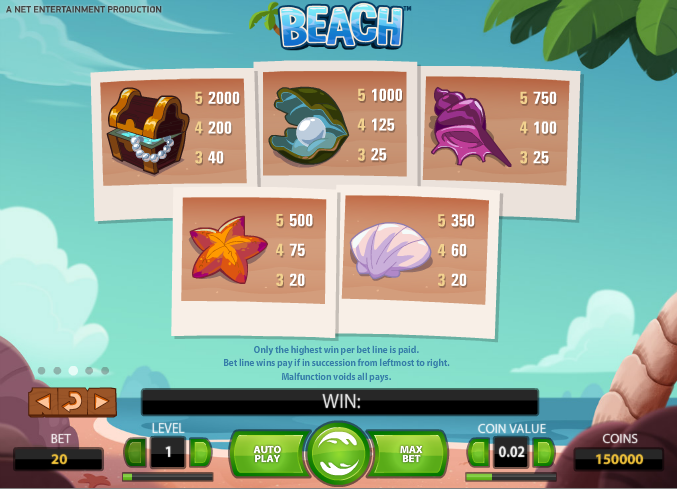 Everybody likes a trip to the beach and this new online slot from Net Entertainment aims to bring the sights and sounds of the seaside to your computer screen. It’s not the usual sunshine and tropical island scene and all the action takes place on a small patch of sand fringed by sea, sand and rocks. It’s a five reel and twenty fixed payline slot with some nice touches; the symbols on the reels are either the standard playing card symbols etched into pebbles or things you would find at the beach. So we have a variety of shells, a treasure chest and a starfish and there’s also a driftwood wild symbol and a message in a bottle scatter. Additionally in the bonus game there’s an octopus wild card. When you press ‘spin’ each new set is brought in by a wave rather than spinning reels. 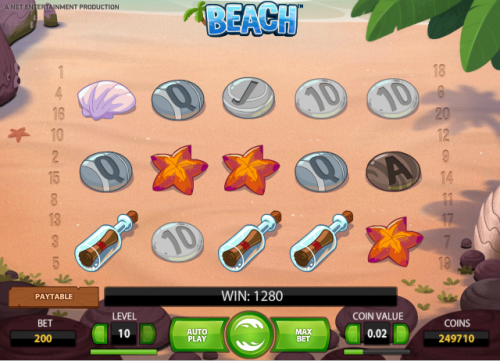 There’s just one bonus feature when you play Beach and you’ll need to land three, four or five of the bottle scatter symbols to earn 8, 16 or 24 free waves (spins). This is pretty decent prize on it’s own, especially if you can get 24 free spins but it’s made a little bit more interesting and profitable with the addition of the octopus wild. The octopus wild only appears in this bonus game and when he does he’ll only pop up on reel three; what he’ll do is have a quick look around the reels and then swap two on neighbouring symbols to himself if there’s a better winning combination to be had. You can see this feature in action in the video below. Beach is a lovely looking game with a neat spin mechanism which sees waves bringing the symbols onto the shore; as you might expect the soundtrack is one of gently lapping waves and there’s a relaxing vibe about the gameplay. The minimum bet is €0.20 per spin up to a maximum of €200.00.